Occasionally, I find amazing little treasures at flea markets or antique stores– tired, chipped, battered pieces that call out to be restored to their former glory or given a new makeover. No one wants to be stuck in a corner of a shop, collecting dust… everyone longs to be in a home with someone who appreciates their value. 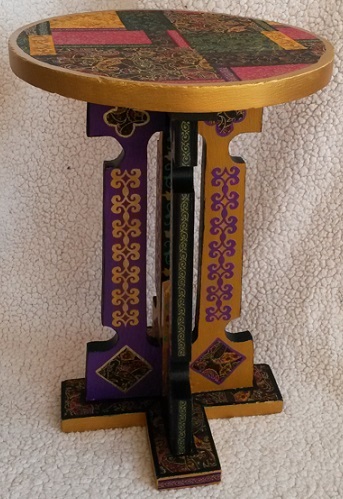 The beautiful little table inspired by illuminated manuscripts. As I decorated this table, I imagined it supporting a cup of tea for a woman reading tales of queens, knights, & trusty white steeds. I imagined it in a very bohemian house where someone meditates serenely, incense floating on the air. I imagined it in a little girl’s room, holding a small lamp & collection of treasured objects. I imagined it being useful & enjoyed once again. Fabric & metallic paint decorate the top of the table. 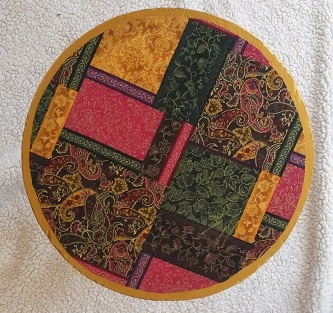 Inspired by illuminated manuscripts, I refurbished this table with jewel tones– amethyst, emerald, & gold. All the papers, fabric, & paints combine to put the FUN back into function. Until it gets its forever home, this table is the perfect height for my coffee mug, journal, & fountain pen. Treasured once again. This entry was posted in A Window on Life, Art and Soul and tagged art, beauty, creativity, furniture, home, home decorating, inspiration, interior design, life, recycling by puresusan. Bookmark the permalink. It’s beautiful, but I wish you had add a photo of before the decorating, we could see the transformation.